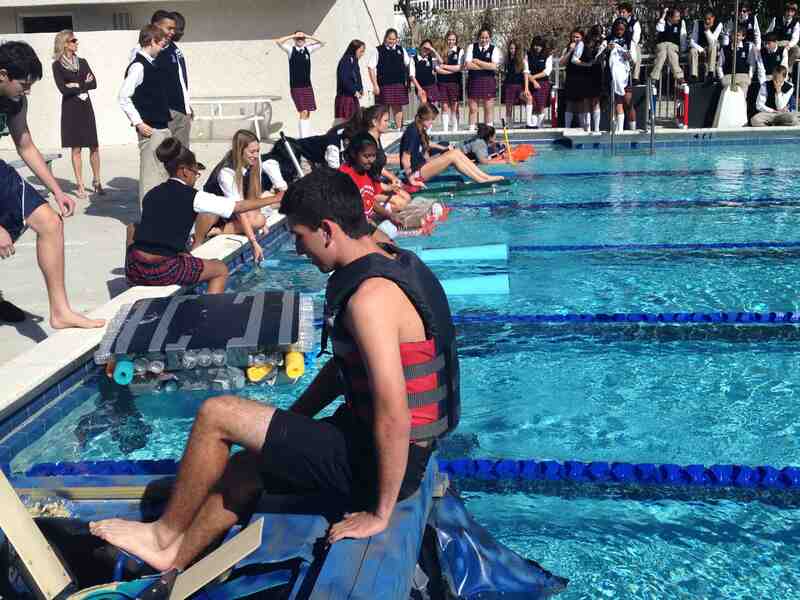 Students had to use at least 70% recycled materials for their vessels. Broadly speaking, the goal of physics is to understand how the universe behaves. It is fitting, then, that physics students should not be contained inside the walls of a classroom. Physics students at Grandview Preparatory School spend time building catapults, slingshots, and kites (and soon, gliders!). Their newest project: building a boat to compete in a Grandview Regatta. Students’ vessels had to consist of at least 70% recycled materials. Some used boogie boards washed up on the beach, others: discarded plywood and PVC piping from construction sites. Still others used milk jugs and silt fencing. No matter the materials, all had to be at most 6 feet wide by 7 feet long. 1. Objects in motion stay in motion until something stops them (like another object or friction). Objects at rest stay at rest until something moves them (like another object running into it). 3. For every action there is an equal and opposite reaction. Like when you accidentally run into the wall, the force from hitting the wall is transferred back to you. And then you get a bruise. Friction: The force that resists the motion of things moving against each other– in this case, the vessel against the water. Buoyancy: It’s just floating, right? WRONG! Buoyancy is the force (from a fluid, like water) that opposes the weight of the thing in the fluid. So, using this knowledge, students created blueprints, gathered recycled materials, and built vessels to enter into the Regatta. Some students even used our new Maker Space to create their constructions. Caitlen Macias, a junior who was part of the group whose vessel won the regatta, said that w hile in the design phase, her group realized that surface area was a big deal. 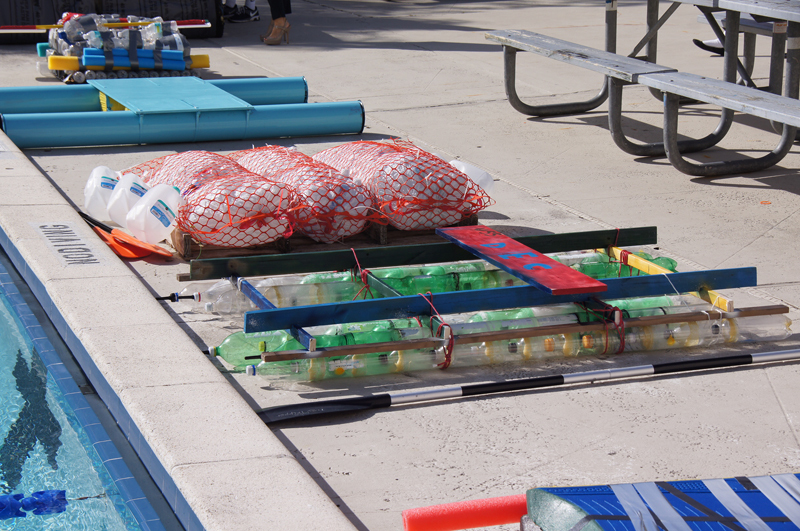 “We changed our design to incorporate the least amount of surface area,” she said, “because surface area creates more friction and forces the boat to go slower.” In preparation for the regatta, the group even tested their design twice at a neighbor’s pool. Tags: Creativity, Experiential learning, Innovation, Physics, projects. Bookmark the permalink. Great way to bring physics to life! Great job on this Haley 🙂 – Love it!